Some former players take it out on us. Why would you want them to autograph card picturing them on THAT team? It gives them a chance to tell about the grudge they still hold. In the 1980s, Astros slugger Glenn Davis was different. 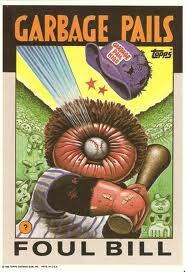 The outspoken Christian was upset with Topps producing Garbage Pail Kids cards. In protest, he vowed not to autograph any of his Topps-made cards. I wondered how collectors were supposed to make his case in front of Topps executives. During my SCD days, I found Davis on the field readying for batting practice at Dodger Stadium. Davis had tried to recruit other Christian players into his autograph boycott. I think Tommy Herr might have participated? Sadly, Davis hasn’t been signing by mail for years. Good luck to all the set collectors. I’m expecting more of these autograph protests in the future. I recently received Glenn Davis through the mail. I sent my request to his home address and included a small donation for The Carpenter’s Way, a home for children that Mr. Davis established. He seemed to appreciate the donation since he signed the cards that I sent and included an extra card signed. Sometimes it takes a little research and creativity to get some players to sign. Thanks for a great blog. I check it out everyday. Well done, Tim! More than the money, I think your letter proved you really wanted Davis to sign. Your success is a great example for all of us. I appreciate your readership. Thanks for the feedback, Tom. As you have pointed out many times, it is important to personalize the letters that you write. In this case, I read about Mr. Davis and The Carpenter’s Way. In the letter, I referenced the important role that The Carpenter’s Way is impacting youth in his community and told him that I wanted to help with the mission of The Carpenter’s Way with a small donation. Again, thanks for a great blog.